Originally described by Linnaeus (1753); Linnaeus (1754), Valerianaceae is traditionally subdivided into three tribes (Graebner, 1906); 1) Patrinieae, 2) Triplostegieae, and 3) Valerianeae. Many authors (see Weberling (1970), Cronquist (1988), Backlund (1996a), Brummitt (1992), and Mabberley (1997)) recognize 14 genera; two in the tribe Patrinieae (Patrinia and Nardostachys), a single genus (Triplostegia) in the tribe Triplostegieae, and 11 genera assigned to five subtribes in the Valerianeae. Six genera besides Valeriana have been recognized in South America (Aretiastrum, Astrephia, Belonanthus, Phuodendron, Phyllactis, and Stangea). Recent treatments of the South American taxa have argued for placing these species in Valeriana, reducing the number of recognized genera within Valerianaceae to eight (Eriksen, 1989 a; Borsini, 1944; Larsen, 1986). Valerianaceae has long been thought to represent a natural group of ca. 350 species distributed throughout much of the world, with the exception of Australia and New Zealand. The group is characterized by a) sympetalous, asymmetric flowers, b) inferior, three-carpelate ovaries, c) one fertile carpel with a single anatropous ovule, d) an achene fruit type, and e) lack of endosperm in the ripe seed (with the exception of Triplostegia). The presence of iridoids of the Valepotriate type in many of the species, including Triplostegia (Backlund and Moritz, 1998), is also characteristic the group. Although the group appears to have a center of origin in Asia, the majority of the species occur in the Andes of South America. Within Valerianaceae there is a degree of differentiation/specialization in flower and fruit morphology. The most noticeable difference in floral morphologies across Valerianaceae is in the number of stamens, which varies from four to one [five stamens have also been reported in Patrinia (Eriksen, 1989 a)]. The trend in the group is toward the reduction in the number of stamens. Donoghue et al. (in press b) inferred from a large chloroplast data set, combined with ITS sequences, that there was an initial reduction in stamen number from the ancestral condition of four to three, then two additional, independent reductions in number to two (in Fedia) and to a single stamen (in species of Centranthus; see Donoghue et al., 2003). The calyx of species of Valerianaceae is either persistent (leafy, as in Nardostachys; reduced to small teeth, as in Fedia and Valerianella; or pappus-like, as in Centranthus and species of Valeriana) or completely lacking. Eriksen (1989 a) hypothesized that the complete reduction of the calyx has occurred independently several times within Valerianaceae (e.g., within the Latin American species of Valeriana). Likewise, the degree of reduction of the two abaxial sterile locules is quite heterogeneous among species of Valerianaceae; from highly reduced to extremely inflated (as seen in some species of Valerianella and Valeriana). These modifications, of both the calyx and the sterile locules, are most likely correlated with means of dispersal. The relationship of Valerianaceae within Dipsacales has been investigated quite extensively using morphological data (Judd et al., 1994; Backlund, 1996b). These phylogenetic analyses place Valerianaceae as sister to Dipsacaceae. Both of these herbaceous groups are united by having distinctive pollen morphology and chlorophyllous embryos, a trait unique within Dipsacales (Backlund, 1996b). The link between Valerianaceae and Dipsacaceae is further supported by simple vessel perforations, modification of calyx lobes, and reduction in the amount of endosperm (Judd et al., 1994; Backlund, 1996b; Manchester and Donoghue, 1995). Various molecular data sets, including sequence data from the chloroplast genes rbcL (Donoghue et al., 1992) and ndhF (Pyck et al., 1999; Pyck et al., 2002), restriction site data (Downie and Palmer, 1992), as well as combined morphological and molecular data (Backlund, 1996b) have now been analyzed. These molecular phylogenetic studies also support the close relationship between Valerianaceae and Dipsacaceae, with this Valerianaceae- Dipsacaceae clade being sister to the Morinaceae, another herbaceous lineage [the Valerina clade sensu Donoghue et al. (2001)]. These data do not tend to support the grouping of Triplostegia with Valerianaceae, but instead place it in a basal position in the clade consisting of species of Dipsacaceae. More recently, phylogenetic analyses based on chloroplast DNA (trnL-F intergenic spacer (IGS), trnL intron, ndhF, matK) (Zhang et al., 2003; Bell et al., 2001) have provided additional insights into the relationships within Valerianaceae. All these analyses (with the exception of matK) place Patrinia at the base of Valerianaceae (with very strong bootstrap support, from both maximum parsimony and maximum likelihood analyses), followed by Nardostachys. 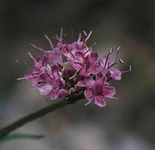 The chloroplast data also support a clade consisting of Valeriana, Centranthus, and Plectritis that is sister to a clade containing Fedia and Valerianella. These data also consistently find Triplostegia to be more closely related to species of Dipsacaceae than to Valerianaceae. Pyck et al. (2002) investigated the phylogeny of the tribe Patrinieae (Graebner, 1906), which consists of Patrinia and Nardostachys, using ndhF sequence data. The author's findings were consistent with other molecular data sets (Donoghue et al., 2001b; Bell et al., 2001). There data suggested that the Patrinieae is not monophyletic and that Patrinia is sister to the rest of Valerianaceae (with the exception of Triplostegia, which was not included in their study), followed by Nardostachys. An additional study looked at sequence data from the atpB-rbcL intergenic spacer region (Raymundez et al., 2002). These authors found results that were highly consistent with all the other studies. They did not, however, sequence any species of Nardostachys, Plectritis, Triplostegia, or species of Dipsacaceae. This study did, however, find support for the grouping of Fedia and Valerianella as a clade. In addition, their data supported a clade consisting of species of Valeriana and Centranthus. Backlund, A. A. (1996): Phylogeny of the Dipsacales. Ph.D. thesis, Uppsala University, Sweden. Backlund, A. A. & Donoghue, M. J. (1996): Morphology and phylogeny of the order Dipsacales. In Phylogeny of the Dipsacales, A. A. Backlund, Doctoral Dissertation. Uppsala: Department of Systematic Botany, Uppsala University, Sweden. Backlund, A. & Moritz, T. (1998): Phylogenetic implications of an expanded valepotriate distribution in the Valerianaceae. Biochem. Syst. and Ecol. 26:309-335. Bell, C. D. (2004a): Preliminary phylogeny of Valerianaceae (Dipsacales) inferred from nuclear and chloroplast DNA sequence data. Mol. Phylogen. Evol. 31:340-350. Bell, C. D. (2004b): Phylogeny and biogeography of Valerina (Dipsacales). Ph.D. thesis, Yale University, USA. Morinaceae (Dipsacales) based on nuclear and chloroplast DNA sequences. Org. Divers. Evol. 3: 227-237. Bell, C. D. & Donoghue M. J. (in press): Dating the Dipsacales: comparing models, genes, and evolutionary implications. Am. J. Bot. Bell, C. D., Edwards, E. J., Kim, S-T., & Donoghue, M. J. (2001): Dipsacales phylogeny based on chloroplast DNA sequences. Harv. Pap. Bot. 6:481-499. Borsini, O. E. (1944): Genera and species plantarum argentinarum, chapter Valerianaceae, pp. 275-372. Descole, Buenos Aires. Argentina. Cronquist, A. (1988): The Evolution and Classification of Flowering Plants. New York Botanical Gardens, Bronx, NY, USA. Donoghue, M.J., Bell, C. D. & Winkworth, R. C. (2003): The evolution of reproductive characters in Dipsacales. Int. J. Plant Sci. 164: S453-464. Donoghue, M. J., Eriksson, T., Reeves, P. A. & Olmstead, R. G. (2001b): Phylogeny and phylogenetic taxonomy of Dipsacales, with special reference to Sinadoxa and Tetradoxa (Adoxaceae). Harv. Pap. Bot. 6:459-479. Donoghue, M. J., Olmstead, R. G, Smith, J. F. & Palmer, J. D. (1992): Phylogenetic relationships of Dipsacales based on rbcL sequences. Ann. Missouri Bot. Gard. 79:333-345. Eriksen, B. (1989): Note on the generic and infrageneric delimitation in the Valerianaceae. Nord. J. Bot. 9:179-187. Graebner, P. (1906): Die Gattungen der naturlichen Familie der Valerianaceae. Bot. Jahrb. Syst. 37:464-480. Hildago, O. Garnatje, T., Susana, A. & Mathez, J. (2004): Phylogeny of Valerianaceae based on matK and ITS markers, with reference to matK individual polymorphisms. Ann. Bot. 93: 283-293. Larsen, B. B. (1986): A taxonomic revision of Phyllactis and Valeriana sect Bracteata (Valerianaceae). Nord. J. Bot. 6:427-446. Meyer, F. G. (1951): Valeriana in North America and the West Indies (Valerianaceae). Ann. Missouri Bot. Gard. 38:377-503. Ozaki, K. (1980): Late Miocene Tatsumitoge flora of Tottori Prefecture, southwest Honshu, Japan. Science Reports of the Yokohama National University Sec. 2 2:40-42. Pyck, N., Roels, P & Smets, E. (1999): Tribal relationships in Caprifoliaceae: evidence from a cladistic analysis using ndhF sequences. Syst. Geogr. Pl. 69:145-159. Pyck, N. & Smets, E. (2000): A search for the position of the seven-son flower (Heptacodium, Dipsacales): combining molecular and morphological evidence. Plant Syst. Evol. 225:185-199. Pyck, N., van Lysebetten, A., Stessens, J. & Smets, E. (2002): The phylogeny of Patrinieae sensu Graebner (Valerianaceae) revisited: additional evidence from ndhF sequence data. Plant Syst. Evol. 233:29-46. Raymundez, M. B., Mathez, J., Xena de Enrech, N. & Duduisson, J.-Y. (2002): Coding of insertion-deletion events of the chloroplast intergene atpB-rbcL for the phylogeney of the Valerianeae tribe (Valerianaceae). C. R. Biologies pp. 131-139. Weberling, F. (1970): in: Hegig, Illustrierte Flora von Mitteleuropa, Familie Valerianaceae, pp. 97-176. Carl Hansen, Munchen, Germany. Zhang, W.-H., Chen, Z.-D. , Li, J.-H., Chen, Y.-C. & Tang, H-B. (2003): Phylogeny of the Dipsacales s.l. based on chloroplast trnL and ndhF sequences. Mol. Phylogen. Evol. 26:176-189.